8:1 Then the men of Ephraim said to him, “What is this that you have done to us, not to call us when you went to fight against Midian?” And they accused him fiercely. 2 And he said to them, “What have I done now in comparison with you? Is not the gleaning of the grapes of Ephraim better than the grape harvest of Abiezer? 3 God has given into your hands the princes of Midian, Oreb and Zeeb. What have I been able to do in comparison with you?” Then their anger against him subsided when he said this. 10 Now Zebah and Zalmunna were in Karkor with their army, about 15,000 men, all who were left of all the army of the people of the East, for there had fallen 120,000 men who drew the sword. 11 And Gideon went up by the way of the tent dwellers east of Nobah and Jogbehah and attacked the army, for the army felt secure. 12 And Zebah and Zalmunna fled, and he pursued them and captured the two kings of Midian, Zebah and Zalmunna, and he threw all the army into a panic. 13 Then Gideon the son of Joash returned from the battle by the ascent of Heres. 14 And he captured a young man of Succoth and questioned him. And he wrote down for him the officials and elders of Succoth, seventy-seven men. 15 And he came to the men of Succoth and said, “Behold Zebah and Zalmunna, about whom you taunted me, saying, ‘Are the hands of Zebah and Zalmunna already in your hand, that we should give bread to your men who are exhausted?’” 16 And he took the elders of the city, and he took thorns of the wilderness and briers and with them taught the men of Succoth a lesson. 17 And he broke down the tower of Penuel and killed the men of the city. 18 Then he said to Zebah and Zalmunna, “Where are the men whom you killed at Tabor?” They answered, “As you are, so were they. Every one of them resembled the son of a king.” 19 And he said, “They were my brothers, the sons of my mother. As the Lord lives, if you had saved them alive, I would not kill you.” 20 So he said to Jether his firstborn, “Rise and kill them!” But the young man did not draw his sword, for he was afraid, because he was still a young man. 21 Then Zebah and Zalmunna said, “Rise yourself and fall upon us, for as the man is, so is his strength.” And Gideon arose and killed Zebah and Zalmunna, and he took the crescent ornaments that were on the necks of their camels. 22 Then the men of Israel said to Gideon, “Rule over us, you and your son and your grandson also, for you have saved us from the hand of Midian.” 23 Gideon said to them, “I will not rule over you, and my son will not rule over you; the Lord will rule over you.” 24 And Gideon said to them, “Let me make a request of you: every one of you give me the earrings from his spoil.” (For they had golden earrings, because they were Ishmaelites.) 25 And they answered, “We will willingly give them.” And they spread a cloak, and every man threw in it the earrings of his spoil. 26 And the weight of the golden earrings that he requested was 1,700 shekels of gold, besides the crescent ornaments and the pendants and the purple garments worn by the kings of Midian, and besides the collars that were around the necks of their camels. 27 And Gideon made an ephod of it and put it in his city, in Ophrah. And all Israel whored after it there, and it became a snare to Gideon and to his family. 28 So Midian was subdued before the people of Israel, and they raised their heads no more. And the land had rest forty years in the days of Gideon. 29 Jerubbaal the son of Joash went and lived in his own house. 30 Now Gideon had seventy sons, his own offspring, for he had many wives. 31 And his concubine who was in Shechem also bore him a son, and he called his name Abimelech. 32 And Gideon the son of Joash died in a good old age and was buried in the tomb of Joash his father, at Ophrah of the Abiezrites. 33 As soon as Gideon died, the people of Israel turned again and whored after the Baals and made Baal-berith their god. 34 And the people of Israel did not remember the Lord their God, who had delivered them from the hand of all their enemies on every side, 35 and they did not show steadfast love to the family of Jerubbaal (that is, Gideon) in return for all the good that he had done to Israel. 2:1 But as for you, teach what accords with sound doctrine. 2 Older men are to be sober-minded, dignified, self-controlled, sound in faith, in love, and in steadfastness. 3 Older women likewise are to be reverent in behavior, not slanderers or slaves to much wine. They are to teach what is good, 4 and so train the young women to love their husbands and children, 5 to be self-controlled, pure, working at home, kind, and submissive to their own husbands, that the word of God may not be reviled. 6 Likewise, urge the younger men to be self-controlled. 7 Show yourself in all respects to be a model of good works, and in your teaching show integrity, dignity, 8 and sound speech that cannot be condemned, so that an opponent may be put to shame, having nothing evil to say about us. 9 Slaves are to be submissive to their own masters in everything; they are to be well-pleasing, not argumentative, 10 not pilfering, but showing all good faith, so that in everything they may adorn the doctrine of God our Savior. 1And the men of Ephraim said unto him, Why hast thou served us thus, that thou calledst us not, when thou wentest to fight with the Midianites? And they did chide with him sharply.2And he said unto them, What have I done now in comparison of you? Is not the gleaning of the grapes of Ephraim better than the vintage of Abiezer?3God hath delivered into your hands the princes of Midian, Oreb and Zeeb: and what was I able to do in comparison of you? Then their anger was abated toward him, when he had said that.4And Gideon came to Jordan, and passed over, he, and the three hundred men that were with him, faint, yet pursuing them.5And he said unto the men of Succoth, Give, I pray you, loaves of bread unto the people that follow me; for they be faint, and I am pursuing after Zebah and Zalmunna, kings of Midian.6And the princes of Succoth said, Are the hands of Zebah and Zalmunna now in thine hand, that we should give bread unto thine army?7And Gideon said, Therefore when the LORD hath delivered Zebah and Zalmunna into mine hand, then I will tear your flesh with the thorns of the wilderness and with briers.8And he went up thence to Penuel, and spake unto them likewise: and the men of Penuel answered him as the men of Succoth had answered him.9And he spake also unto the men of Penuel, saying, When I come again in peace, I will break down this tower.10Now Zebah and Zalmunna were in Karkor, and their hosts with them, about fifteen thousand men, all that were left of all the hosts of the children of the east: for there fell an hundred and twenty thousand men that drew sword.11And Gideon went up by the way of them that dwelt in tents on the east of Nobah and Jogbehah, and smote the host: for the host was secure.12And when Zebah and Zalmunna fled, he pursued after them, and took the two kings of Midian, Zebah and Zalmunna, and discomfited all the host.13And Gideon the son of Joash returned from battle before the sun was up,14And caught a young man of the men of Succoth, and inquired of him: and he described unto him the princes of Succoth, and the elders thereof, even threescore and seventeen men.15And he came unto the men of Succoth, and said, Behold Zebah and Zalmunna with whom ye did upbraid me, saying, Are the hands of Zebah and Zalmunna now in thine hand, that we should give bread unto thy men that are weary?16And he took the elders of the city, and thorns of the wilderness and briers, and with them he taught the men of Succoth.17And he beat down the tower of Penuel, and slew the men of the city.18Then said he unto Zebah and Zalmunna, What manner of men were they whom ye slew at Tabor? And they answered, As thou art, so were they; each one resembled the children of a king.19And he said, They were my brethren, even the sons of my mother: as the LORD liveth, if ye had saved them alive, I would not slay you.20And he said unto Jether his firstborn, Up, and slay them. But the youth drew not his sword: for he feared, because he was yet a youth.21Then Zebah and Zalmunna said, Rise thou, and fall upon us: for as the man is, so is his strength. And Gideon arose, and slew Zebah and Zalmunna, and took away the ornaments that were on their camels' necks.22Then the men of Israel said unto Gideon, Rule thou over us, both thou, and thy son, and thy son's son also: for thou hast delivered us from the hand of Midian.23And Gideon said unto them, I will not rule over you, neither shall my son rule over you: the LORD shall rule over you.24And Gideon said unto them, I would desire a request of you, that ye would give me every man the earrings of his prey. (For they had golden earrings, because they were Ishmaelites. )25And they answered, We will willingly give them. And they spread a garment, and did cast therein every man the earrings of his prey.26And the weight of the golden earrings that he requested was a thousand and seven hundred shekels of gold; beside ornaments, and collars, and purple raiment that was on the kings of Midian, and beside the chains that were about their camels' necks.27And Gideon made an ephod thereof, and put it in his city, even in Ophrah: and all Israel went thither a whoring after it: which thing became a snare unto Gideon, and to his house.28Thus was Midian subdued before the children of Israel, so that they lifted up their heads no more. And the country was in quietness forty years in the days of Gideon.29And Jerubbaal the son of Joash went and dwelt in his own house.30And Gideon had threescore and ten sons of his body begotten: for he had many wives.31And his concubine that was in Shechem, she also bare him a son, whose name he called Abimelech.32And Gideon the son of Joash died in a good old age, and was buried in the sepulchre of Joash his father, in Ophrah of the Abiezrites.33And it came to pass, as soon as Gideon was dead, that the children of Israel turned again, and went a whoring after Baalim, and made Baalberith their god.34And the children of Israel remembered not the LORD their God, who had delivered them out of the hands of all their enemies on every side:35Neither showed they kindness to the house of Jerubbaal, namely, Gideon, according to all the goodness which he had showed unto Israel. 1But speak thou the things which become sound doctrine:2That the aged men be sober, grave, temperate, sound in faith, in charity, in patience.3The aged women likewise, that they be in behaviour as becometh holiness, not false accusers, not given to much wine, teachers of good things;4That they may teach the young women to be sober, to love their husbands, to love their children,5To be discreet, chaste, keepers at home, good, obedient to their own husbands, that the word of God be not blasphemed.6Young men likewise exhort to be sober minded.7In all things showing thyself a pattern of good works: in doctrine showing uncorruptness, gravity, sincerity,8Sound speech, that cannot be condemned; that he that is of the contrary part may be ashamed, having no evil thing to say of you.9Exhort servants to be obedient unto their own masters, and to please them well in all things; not answering again;10Not purloining, but showing all good fidelity; that they may adorn the doctrine of God our Saviour in all things.11For the grace of God that bringeth salvation hath appeared to all men,12Teaching us that, denying ungodliness and worldly lusts, we should live soberly, righteously, and godly, in this present world;13Looking for that blessed hope, and the glorious appearing of the great God and our Saviour Jesus Christ;14Who gave himself for us, that he might redeem us from all iniquity, and purify unto himself a peculiar people, zealous of good works.15These things speak, and exhort, and rebuke with all authority. Let no man despise thee. 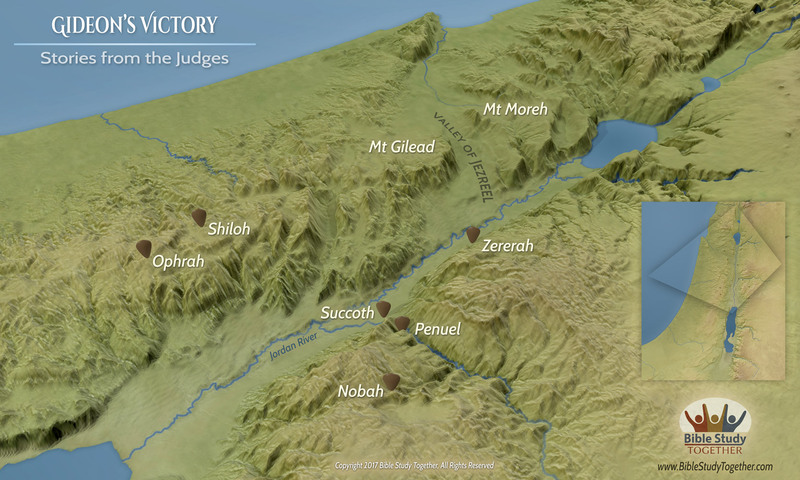 How did Gideon defeat 135,000 men with only 300 people? Why did those who follow Gideon fail to follow God? How was Titus to teach people in your position in life? How does the grace of God teach us things? Encourage people to live according to the sound doctrine in Titus 2:2-10.